1. when you copy an ability from one character to another you need to change the "<frame>" numbers and "next:"s and its pretty annoying, why not make a tool that can do that with only 1 press? 2.a tool that will take the first frame of an ability and the number of pics the ability got, the result will be a whole ability with correct frame numbers, nexts and pics. 3. a tool that will put spesific tag (like bdy, ITR and stuff) to all the frames of a player. do you have any other ideas for this project? From what I understand LF2 IDE can do 1 and 3 with its "frame merge" function, although nothing stopping you from creating a simple standalone one. 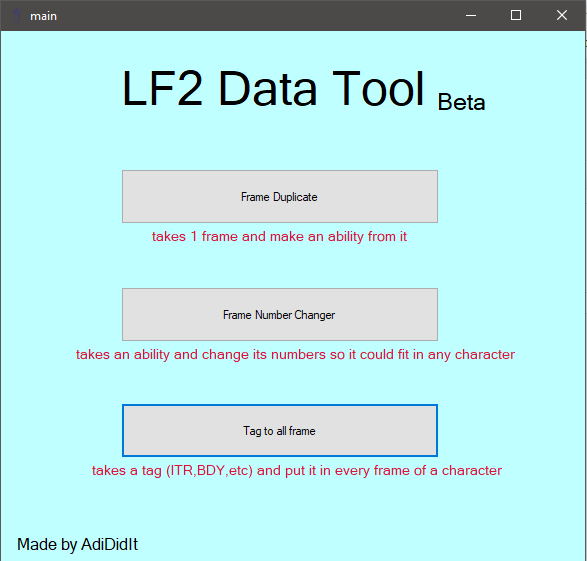 Not sure what you mean by 2 but it seems you're talking about some kind of frame generator which is also available in some data changers (LF IDE, LF Studio, maybe others...). My opinion on this is these sort of tools are more suitable as plugins for existing data changers and both the DCers I mentioned support plugins. Then again nobody is forcing you to do so. 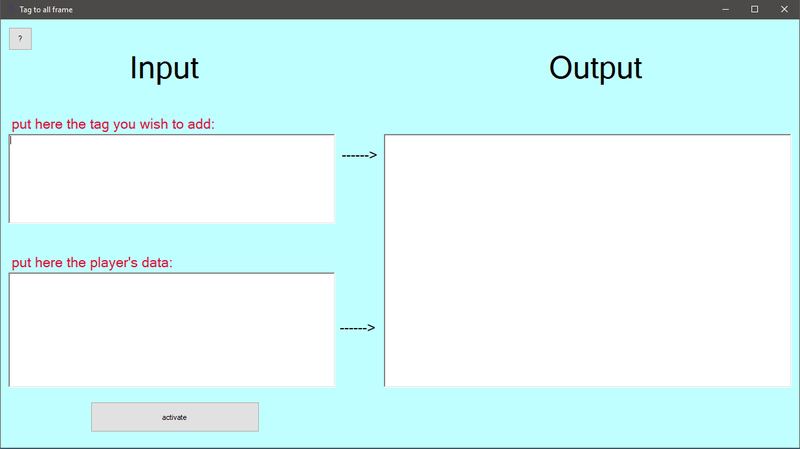 This Is The Beta version, it contains 3 options (which I mention at the beginning). I dont know about the frame merge function and I never used LF2 IDE (download doesnt work). can you explane what it does? Some images would be good right..
(10-09-2018, 05:34 AM)dan007/^"" Wrote: Some images would be good right..
there is a "?" button in each that explanes what each of the tools and how to use it so it can be understood. plugins/collaboration on a common feature-full data changer (currently luigi600 works on an excellent one) seems to be the right idea here. Current time: 04-24-2019, 06:57 AM Powered By MyBB, © 2002-2019 MyBB Group. Theme created by Silverthorn.